Biologically active blue-green sea algae, sea salts and minerals in JASON Sea Fresh Mouthwash help heal, detoxify and strengthen gums and teeth. This refreshing mouthwash will leave your entire mouth feeling wonderfully clean and healthy. Perilla seed extract neutralises bacteria and sugar acids, protecting your teeth from erosion. 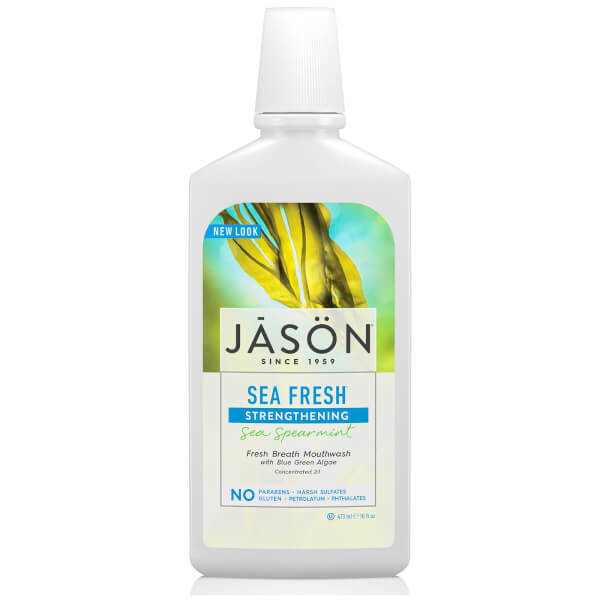 JASON Sea Fresh Mouthwash also features deep sea spearmint to blast away bad breath to ensure your mouth stays fresh and clean all day. After brushing, rinse a minimum of twice a day. For best results, swish for 20-30 seconds.